That PFF quote made me feel nice. There's also this, which goes against the common perception that he "only ran a few routes"
I've done a film review and some charting of Patterson's rookie season. I'll put together an analysis in several sections, roll out one every day or two. The main focus will be on his work as a receiver. How often did he get on the field? Where did he line up? What routes did he run? What coverage did he face? How did his QBs do? Did he make any obvious mistakes? 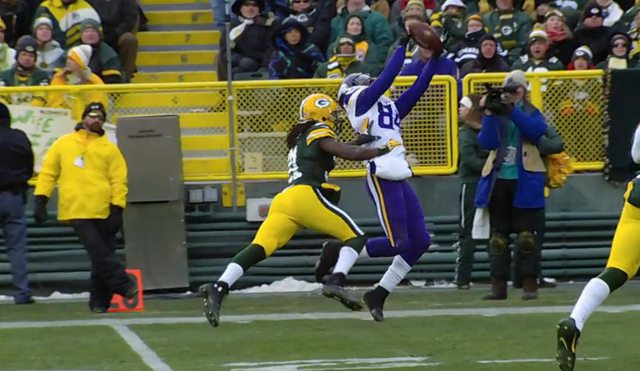 Patterson started the year as a bit player, behind Jerome Simpson on the depth chart at split end. 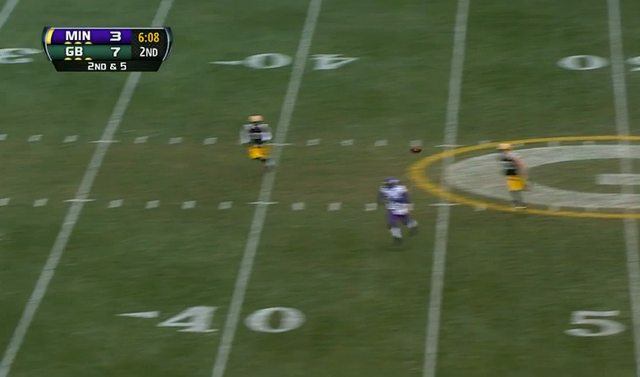 He played far less than half of the snaps on offense until the middle of the year (game #10, at Seattle), the week Simpson ran into legal trouble and lost his starting job and Greg Jennings was out with an injury. His role expanded after that, but he still rarely saw the field on more than 60% of snaps. I've charted 83 pass plays where Patterson was the primary target (including DPIs, throwaways and batted passes). Those 3 games account for 24 of his targets. Another 10 came on the road at Lambeau. 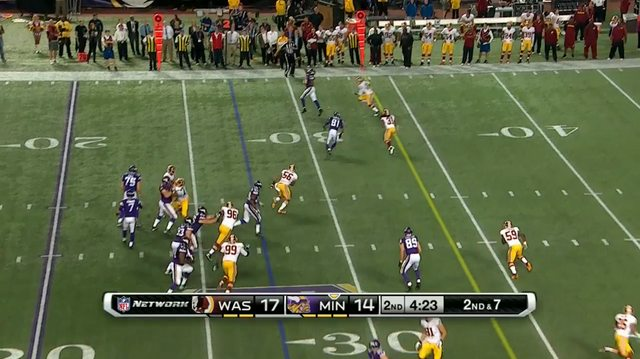 Another 7 came during the Josh Freeman debacle in NY on MNF. Those 5 games account for roughly half of Patterson's targets. Patterson played 446 snaps last year. On 292 of them, he ran a pass route. 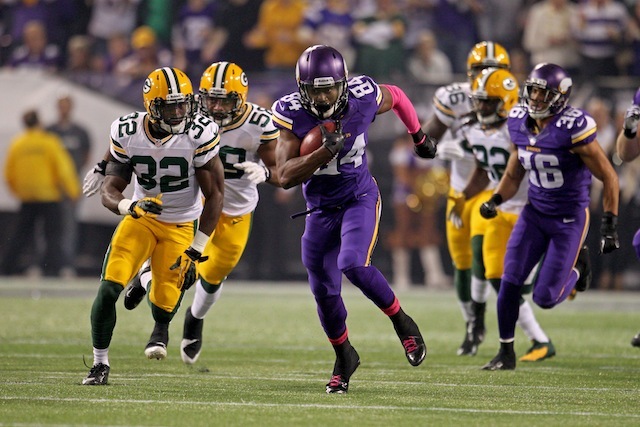 Greg Jennings led the team with 497 pass routes run in 15 games, 39 WRs across the league ran 500 or more. 88 WRs ran more routes than Patterson last year. Most of the rookies on the bottom half of that list missed multiple games, including Austin and Dobson. Justin Hunter's usage was most similar to Patterson's, in that he played in almost every game but only exceeded 60% of snaps in 3 games (Patterson did it twice). 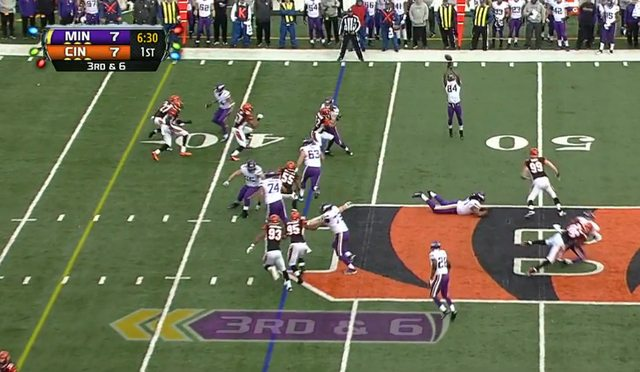 PFF charted Patterson as running 292 pass routes, on which he was targeted 72 times. That number doesn't include penalties (including DPI), throwaways and batted passes. It also excludes decoy routes on running plays. 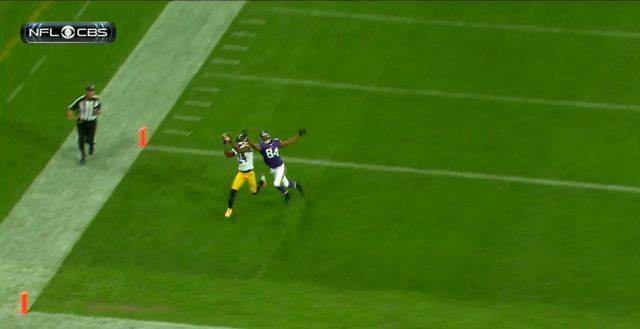 I went through the Vikings season on GamePass and found 83 pass plays where Patterson was the target, including the plays that PFF excludes. There'll be a few minor discrepancies between my charting and PFF, which I'm not bothering to reconcile. I'll present my notes as a series of questions and answers. Where did Patterson line up in formation? Was he used more as an outside WR or a slot receiver? 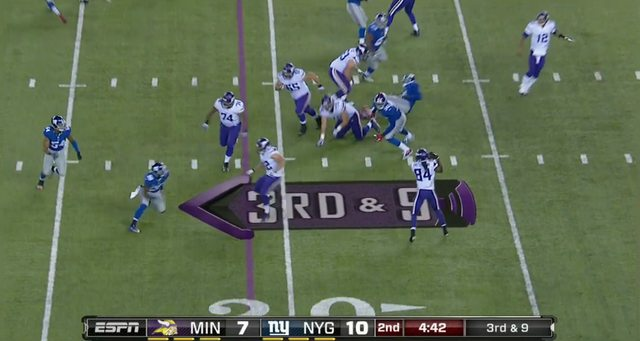 On 60 of the 83 plays (72%) where he was targeted, Patterson lined up outside. 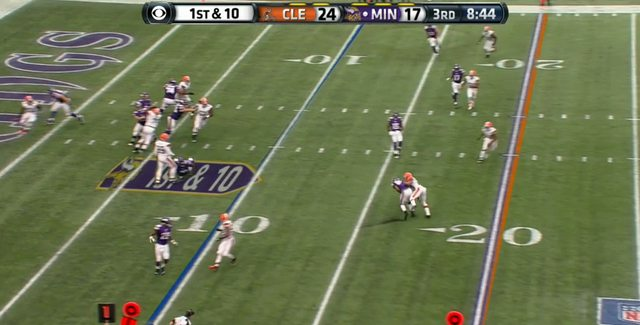 That includes plays where he was a step off the LOS and where he was the outside man in a 3-WR bunch. He was in the slot for 22 of his targets, plus 1 where he lined up in the backfield and ran a screen into the flat. 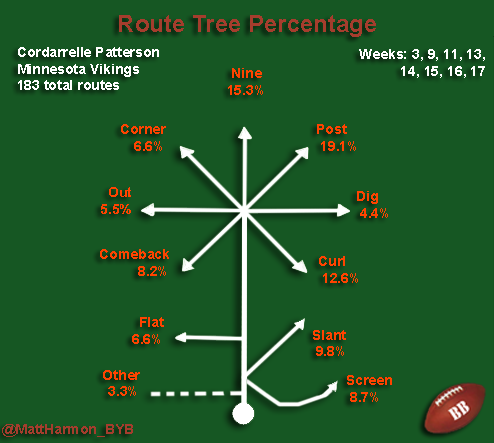 PFF says Patterson ran 51 routes from the slot of the 292 in total (17.5%), meaning he ran 241 as an outside WR. They charted him as having 21 targets from the slot (~40%) of his total 72 targets. That means the other ~50 targets came on ~240 routes from outside (~20%). So while he lined up outside on 80% of plays, the 17% where he was in the slot accounted for 40% of his targets (and nearly half of his receiving yards). Did he get to play in all game situations? Patterson was hardly ever targeted on 3rd down or in the red zone for the first half of the year. His first 3rd down target came in the MNF game in NY. His first target in the end zone was vs Washington (the TD). That play, in the 9th game of the year, was only the 2nd time all season he'd been targeted in the red zone. 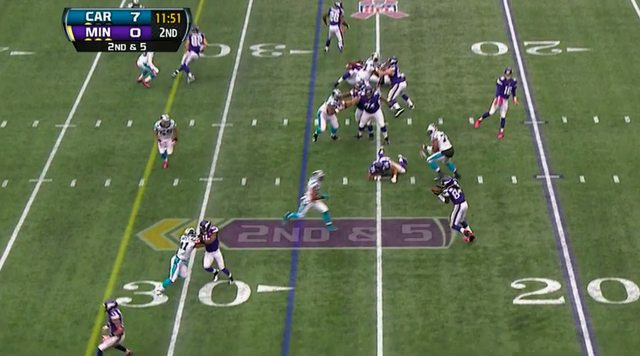 For the second half of the year, Patterson played in all game situations and field positions, including 3rd down and red zone. What kind of routes did he run? This analysis is limited by looking at his targets, not just any route he ran where he wasn't thrown to. Most of his targets at the beginning of the year were on screens and go routes. 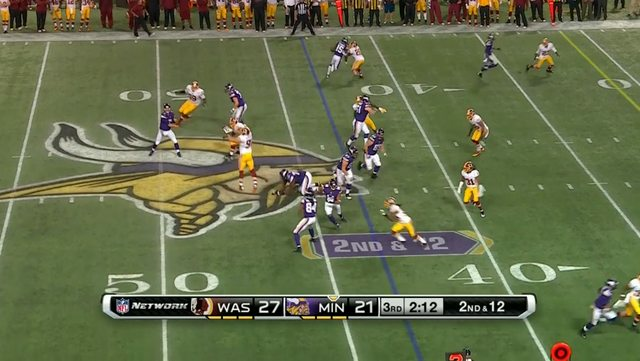 Of the first 15 passes thrown to Patterson, 8 were screens and 3 were go (deep) routes. Hard to say for sure without watching every single snap he played on coaches film. 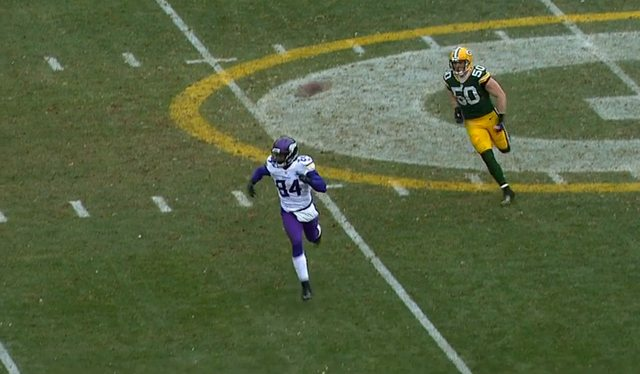 It seems Patterson wasn't getting open very often, especially at the beginning of the year. Over half of his first 15 targets were screen passes. Most of his downfield targets were contested. I did watch enough coaches film to believe that he was getting open more often by the end of the year. 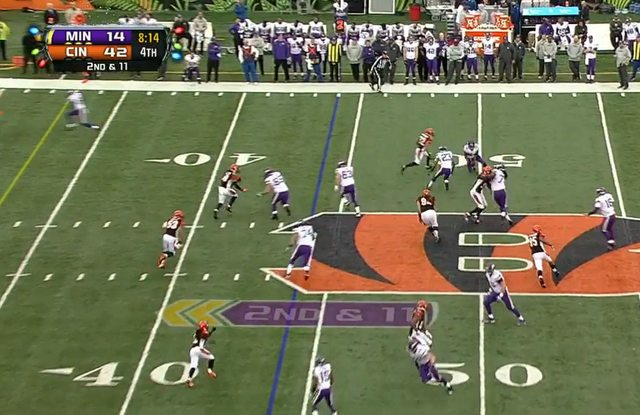 Even then, the coaches film shows Patterson to be the worst of the WRs in terms of getting upfield quickly and making quick cuts -- Simpson, Wright and especially Jennings are open way more often than he is. 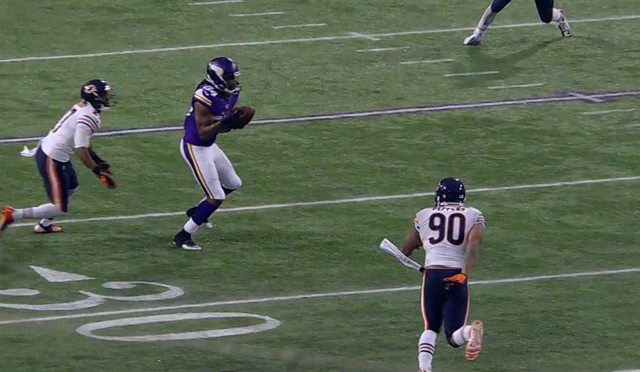 One of the main changes toward the end of the year is the increasing number of balls thrown Patterson's way even when he's covered, especially on back shoulder throws. How can you be sure his situational usage, route tree and success vs coverage improved during the year? Not totally sure, but it seems likely based on the targets alone. I did review two games in detail, one early in the season and one late, to contrast and compare, and found some supporting evidence. -- played 20/80 offensive snaps, by PFF. I charted 19 plays. -- 3/19 were in the red zone, 0 targets. -- 3/19 were on 3rd down, 0 targets. -- 11/19 were called passes, including one scramble. 10 throws, 10 routes charted. -- played 35/61 offensive snaps, by PFF. I charted 32 plays (I think they mistook Joe Webb for Patterson). 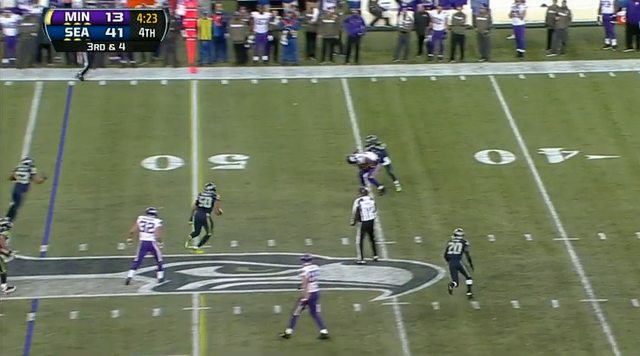 -- 3/35 were in the red zone (they didn't get to the red zone often), of which 2 were Patterson targets. -- 27/35 were called pass plays, including 2 sacks and a scramble. 24 throws, 23 routes charted. On one play, Patterson lines up at tailback, play action fake, throw to Ford. 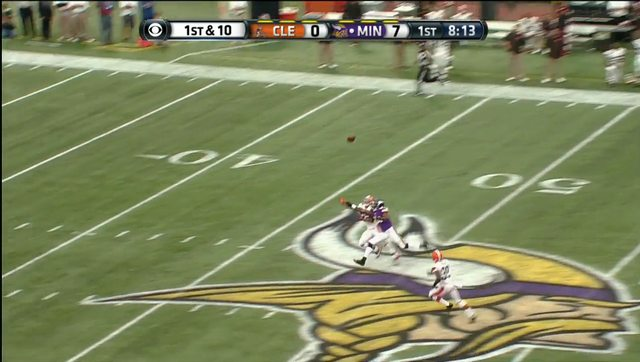 This is again based on Patterson as a receiver only. 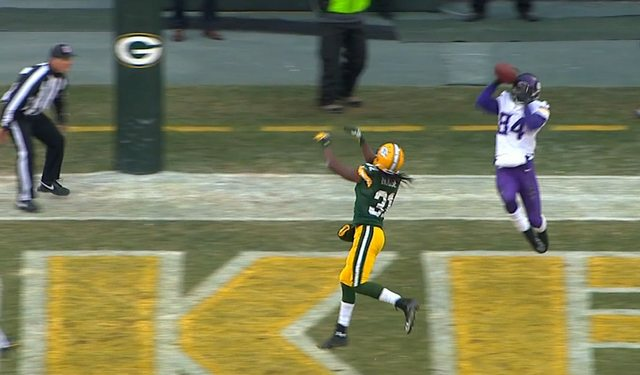 I reviewed 83 pass plays on which Patterson was the primary target. This included DPIs (4) and batted passes (4). 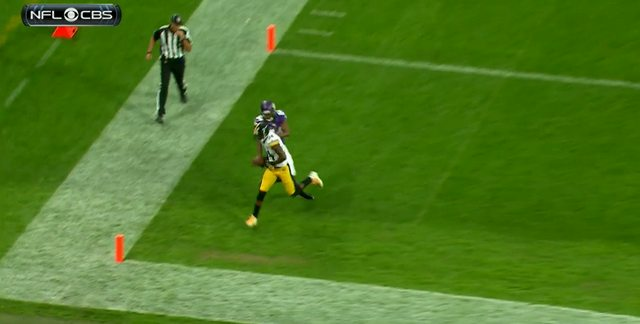 There were also several passes where the QB was intentionally throwing it away in Patterson's direction (over his head out of bounds, for instance). PFF labeled 3 passes as throwaways, there were a couple of others that I thought were arguable. On 292 pass routes, Patterson produced 1.61 yards per pass route run. Patterson looks pretty good there. His YPRR of 1.61 was tied for 45th of 94 WRs who played >25% of team snaps, ahead of some big names (Larry Fitzgerald, Mike Wallace) and of all the other rookie WRs except Keenan Allen (15th in the league with 2.06). DeAndre Hopkins finished with 1.28, Tavon Austin had 1.37. Patterson's 469 receiving yards included 286 yards after catch (YAC). As we'll see in a minute, almost all of those YAC yards came on screens. 469 - 286 = 183 "yards in air" (YIA). On 45 catches, that's barely 4 yards of YIA per catch. That's only slightly better than Percy Harvin's average of ~2 YIA per catch in 2012. 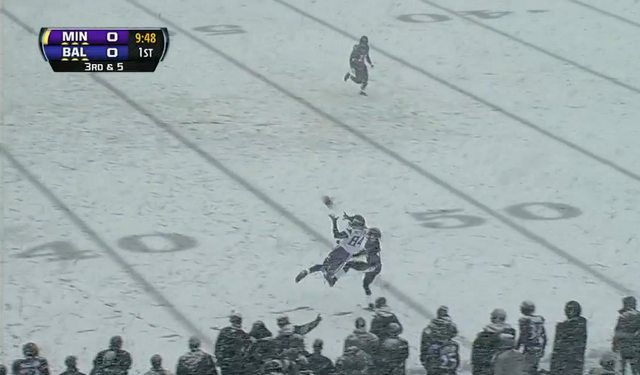 Patterson only played 446 snaps (note: includes blocking) but still produced 4 receiving TDs: the shallow crossing route against Dallas, short end zone fade back shoulder catches against Philadelphia and Detroit, plus the long screen pass against Baltimore in the snow. 38 WRs caught 5+ TDs last year. None of them played less than 500 snaps, only 5 of them played less than 700 (Greg Jennings had 4 TD receptions on 754 snaps). Quite a few WRs caught more TDs than Patterson on a similar number of receptions, or the same amount of TDs on fewer catches. Kenny Stills had 32 catches, 5 TDs. 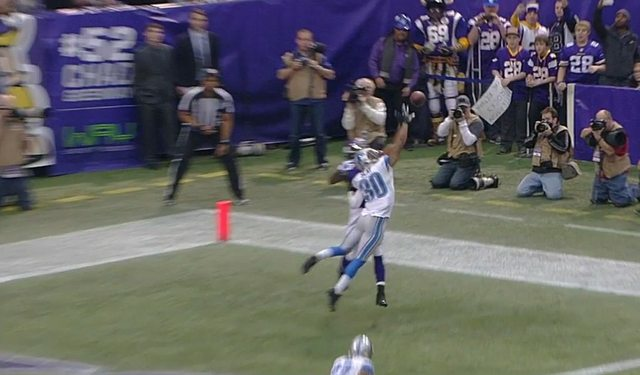 Marvin Jones had 51 catches, 10 TDs. Patterson had 45 catches, 4 TDs. Of course, he also added 2 TDs on KRs and another 3 on running plays (on 12 attempts). 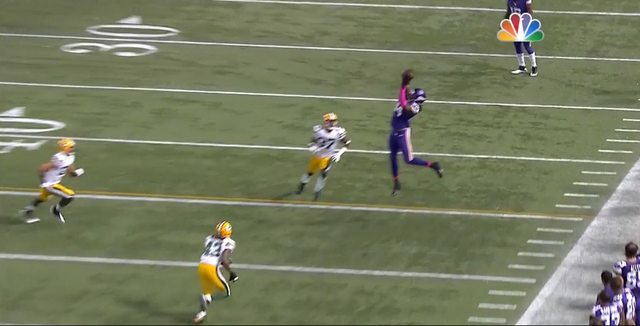 Of 83 plays with Patterson as primary target, 7 were throwaways or batted passes, which aren't attributed to the WR. -- 4 were DPIs (all deep patterns, for a total of 119 yards). These are counted as successes. So his overall success rate was 32 / 76 (42%). Is that good or bad? Well, it's not great. Patterson's 42% was matched by Tavon Austin's 42%, both slightly behind Justin Hunter (44%) and well behind DeAndre Hopkins (55%). The "success rate" stat punishes WRs who rack up catches and yards underneath unless they produce enough to convert first downs. Screen passes are easy completions but difficult to turn into successful plays for the offense to keep the sticks moving, that's the point. You can see the effect if you break down Patterson's success rate by target zone. 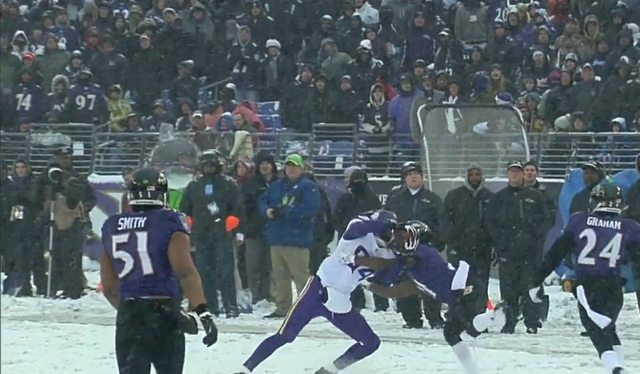 Patterson was targeted 23 times behind the line of scrimmage (22 screens, 1 swing pass). 2 of those passes were batted at the line. You can see the huge gap between the completion rate (excellent, but these are very easy throws and we threw out 2 batted passes), the YPA (excellent, but skewed by the 79 yard TD in Baltimore, on the other 20 attempts it was < 5.0) and the success rate (terrible). 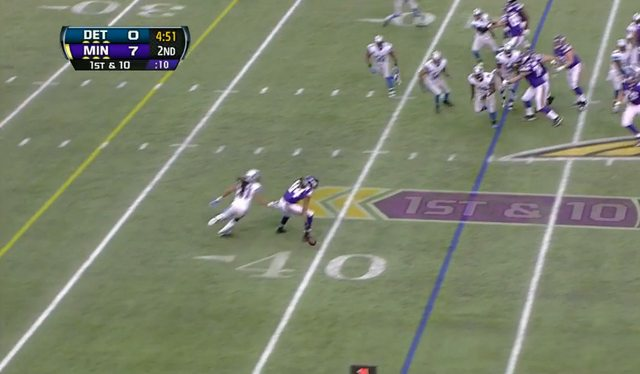 Needless to say, all of the yardage on these passes is YAC. 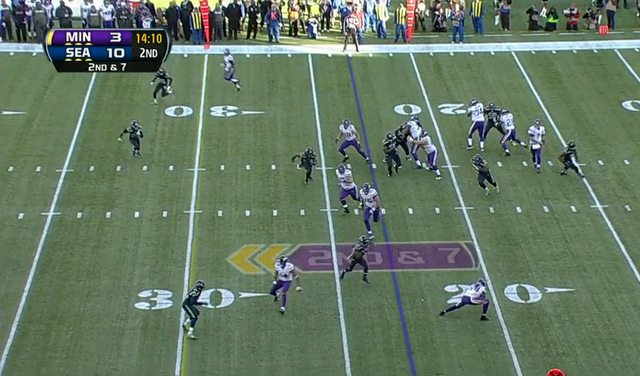 YAC would actually be considerably more than 181, because the average depth of target of these plays was -3 or -4. Given 19 catches behind the LOS for 181 yards, you can see that these screen passes account for almost all of Patterson's YAC (286 yards) for the year. 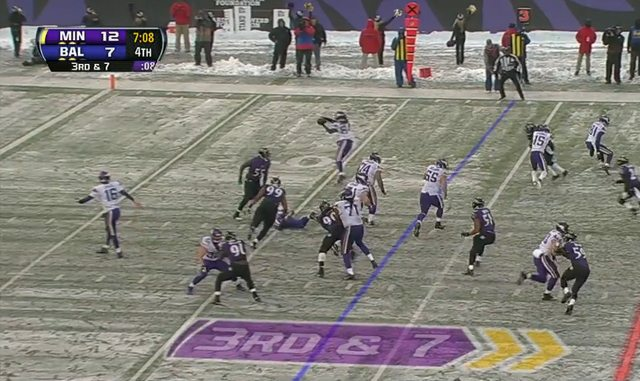 The success rate here is a little harsh: a couple of times, a screen to Patterson was called on 3rd and very long in order to shift field position. 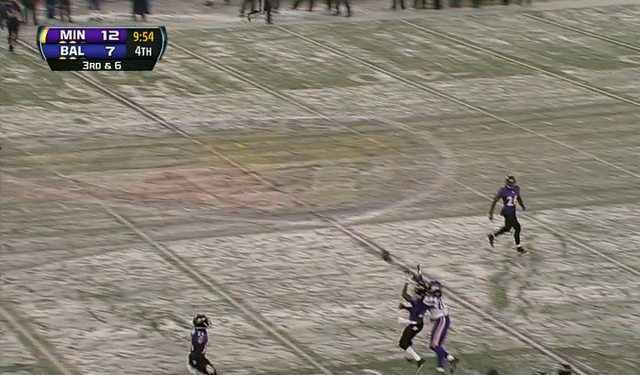 He gained 14 yards on a screen on 3rd and 24 in the Ravens game to set up a 40 yard FG, which is a successful play even if it doesn't get marked as such here. Of course, the lack of success on screens isn't entirely Patterson's fault. Missed blocks, badly placed passes (I'll show examples later) and obvious play calling or design could and did put him in difficult situations. Patterson was targeted on 35 passes between 1-15 yards downfield. One of those was batted down at the line. Here, the completion percentage isn't great (some of that is on Patterson for not getting open, some of it is good defense, some of it is terrible accuracy by the QBs), the YPA is terrible, but the success rate is half decent. YIA on the 21 short completions was only 108 by my charting -- barely 5 yards downfield per completion. 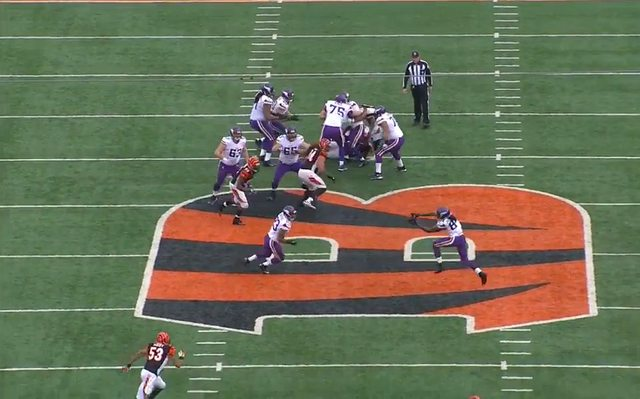 That's because most of Patterson's routes on these plays were on "the shorter side of short" -- quick slants, 7 yard comebacks or curls. 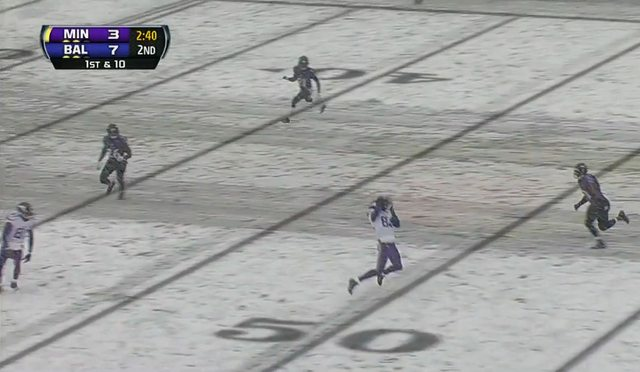 There weren't many 12 yard outs or 14 yard digs, which would have improved the yardage (assuming they connected). There was surprisingly little YAC on the short patterns: 20 YAC on 21 catches, just under 1 yard per catch, by my charting. 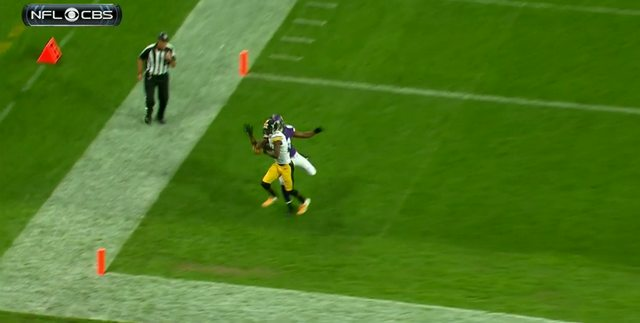 Most of these catches took place right in front of a CB, Patterson was often tackled before he could even look to try to run. Patterson was targeted on 22 passes 16+ yards downfield. One of those was batted down at the line. Here, the completion rate is terrible, the YPA is bad considering the depth of target, and the success rate isn't great (and only halfway respectable thanks to the DPIs). Patterson's worst drops came on deep patterns (I'll get into that later). If he'd been able to haul a couple of those very catchable passes in, his numbers here would be solid. 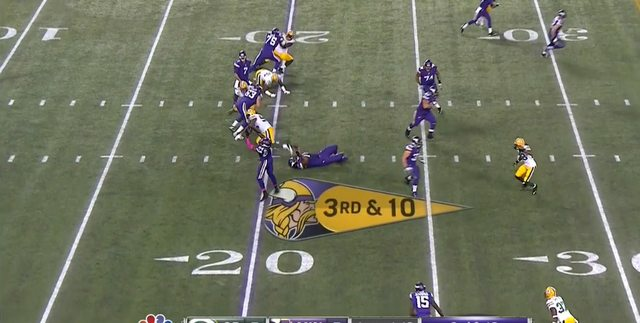 Again, there was little or no YAC on these plays, most of which consisted of Patterson coming down with a back shoulder ball or underthrown pass (the one vs Cleveland). 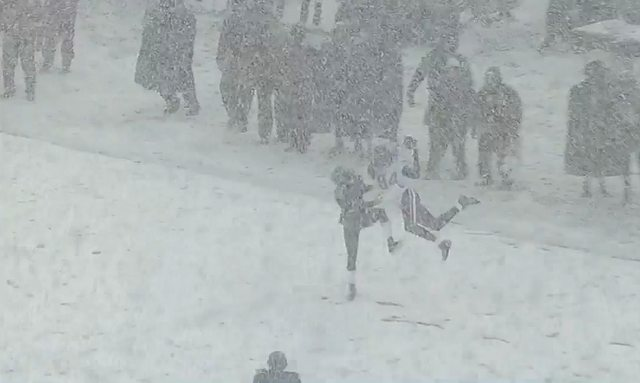 He did evade a tackler or two in the open field vs Washington and could have picked up more yards on a wide open catch vs Baltimore, but he slipped in the snow. Very similar at every level. Austin had more short routes and fewer screens and deep routes. Keep them coming, Krauser. You're putting in some OT making these breakdowns. 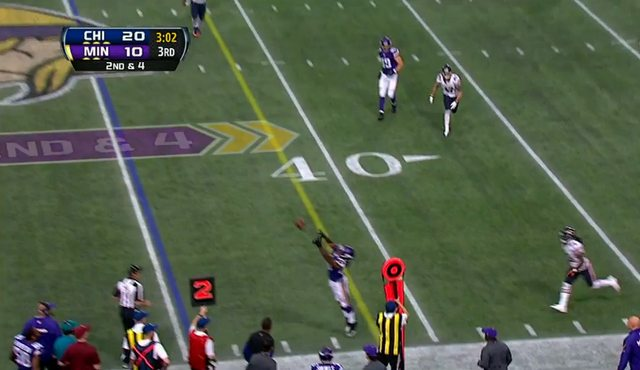 For this section, I've analyzed the video for every pass targeted to Patterson in 2013. -- How many difficult catches did he have to make? -- How many difficult but catchable balls did he fail to come up with? -- How many easy catches did he drop? -- How many plays were broken up by the defense? -- How was his production affected by the accuracy of the QBs? I'll include a number of images -- screenshots and maybe a few gifs -- so I'll break up the analysis into separate posts. I charted 23 screen passes targeted to Patterson. I charted all of these as accurate throws, along with 10 others. 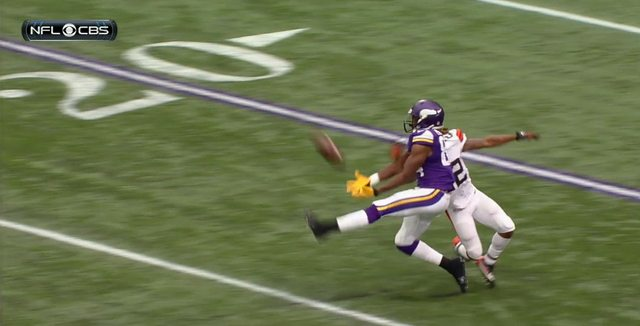 All 14 accurate throws on screen passes were caught by Patterson. These 5 completions were for a total of 8 yards. 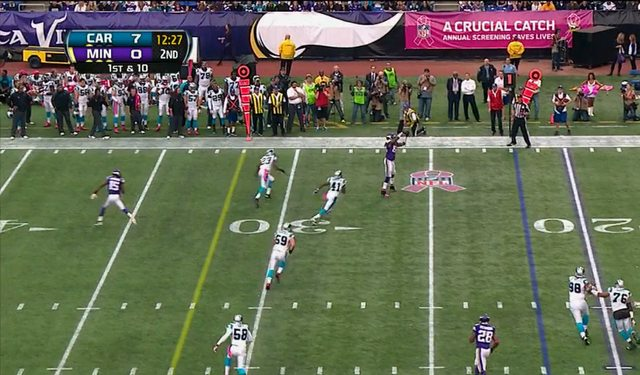 How did QB accuracy affect Patterson's production on these screen passes? 5/7 for 8 yards, 0 first downs (including 9 yards on 3rd and 10 and 4 yards on 3rd and 7), 0 TDs. I defined "short" here as less than 10 yards beyond the LOS. I charted 29 short passes targeted to Patterson. Of those, 1 was batted at the line. 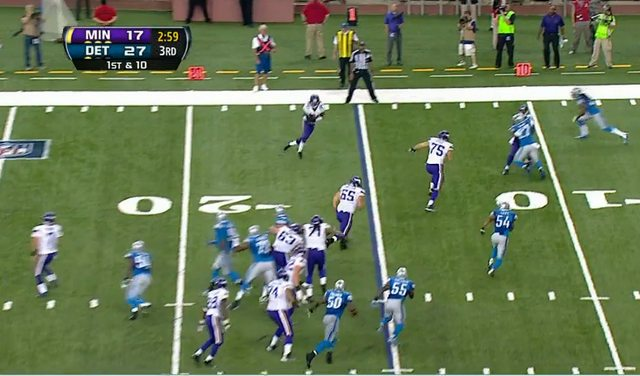 Patterson was open running a short curl route vs Detroit, Cassel's pass was batted down. 14 of them were accurate throws. Those 13 catches went for 87 yards and 2 TDs (back shoulder throws on fade routes, vs the Eagles and Lions), but only included 9 YAC. These were all very quick patterns (curls, comebacks, slants) with defenders right on top of the play. Some of these catches were fairly difficult despite an accurate throw, because the catch point was contested. 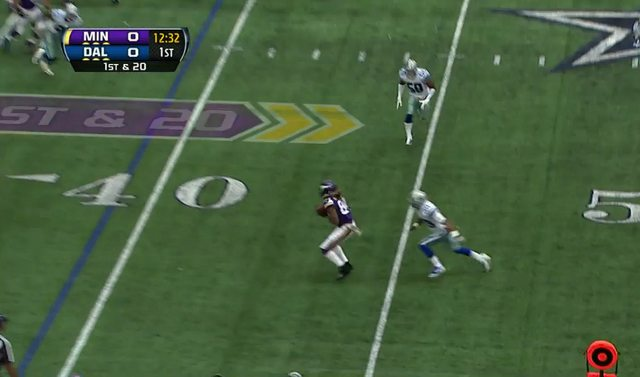 Patterson showed good body control and hands there, including on the back shoulder TDs. The last catch there is extremely impressive, he's running from left to right across the photo and has to spin 180 degrees and stab the ball directly behind him. I'll post a gif later, if I can figure out how to make one. 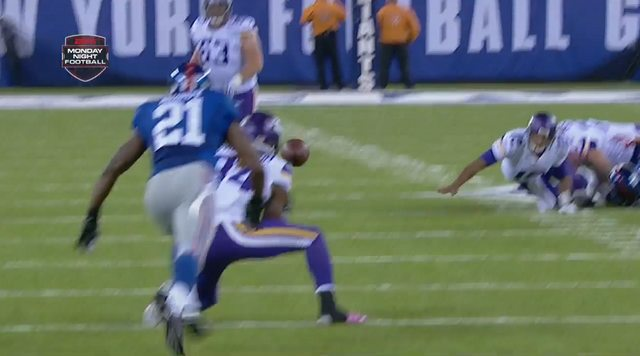 There was also a clear throwaway from Freeman under pressure in the Giants game. Patterson was open on most of these missed passes, probably every one except the pick 6 and the back shoulder end zone throw vs the Lions. It's fair to think that inaccurate short passes cost Patterson 5 or more additional catches. I defined "intermediate" here as 10-20 yards beyond the LOS. I charted 12 intermediate passes targeted to Patterson. Of those 12, 1 was batted at the line. 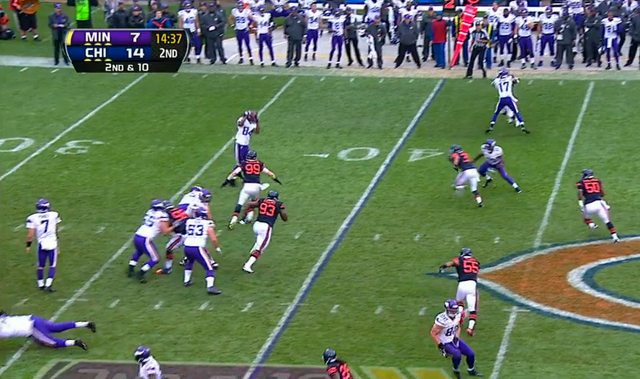 Patterson was open running a short curl route vs Chicago, Cassel's pass was batted down. 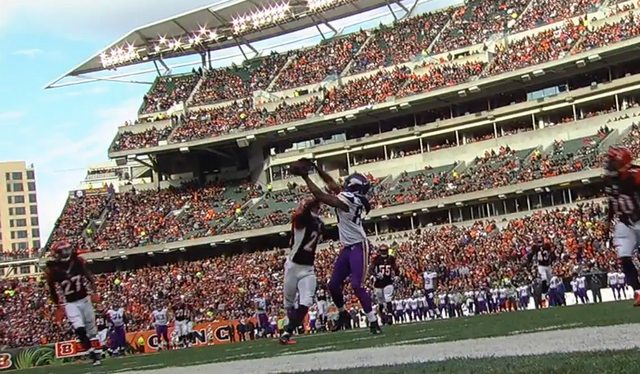 3 of Cassel's 33 passes to Patterson were definitely tipped or batted down at the line, a 4th (the uncatchably high screen pass against the Bengals) may have been tipped. Of the 11 that made it past the line, 1 was definitely a throwaway. 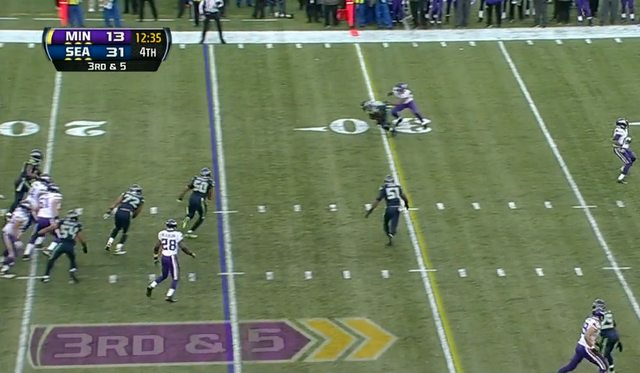 Ponder rolling right under pressure in Seattle, threw it well OOB with Patterson nearby running an out (he was covered). Of the remaining 10, only 3 were accurate throws. "Accurate" again means hitting the WR in the chest or at eye level. Looks like good technique, using his hands. This is likely a "concentration drop". 7 of the throws were inaccurate. 4 of them were catchable. 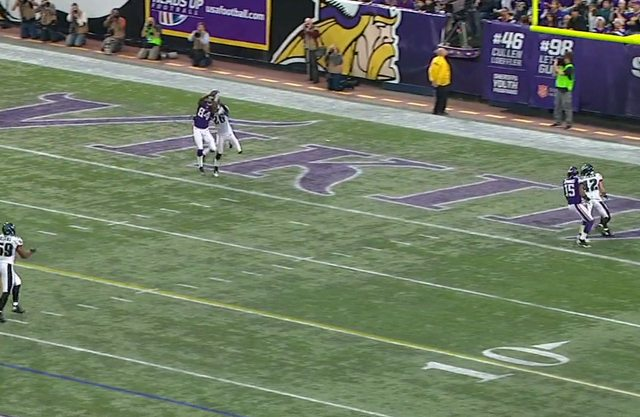 You can fault Patterson for not securing the catch, but the high pass (ball was also delivered a bit late in the route) gave the CB a chance to make a play, and he did. 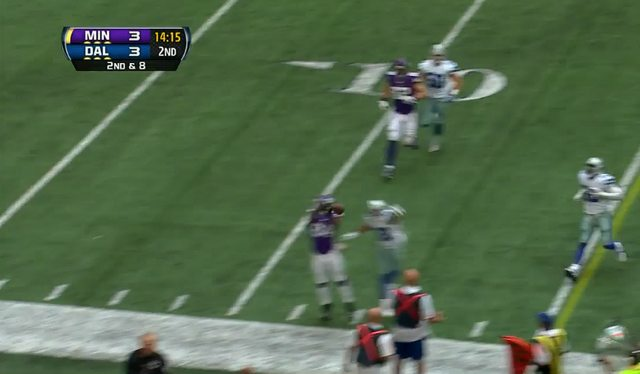 If Cassel puts the ball on his chest, that's probably a TD. 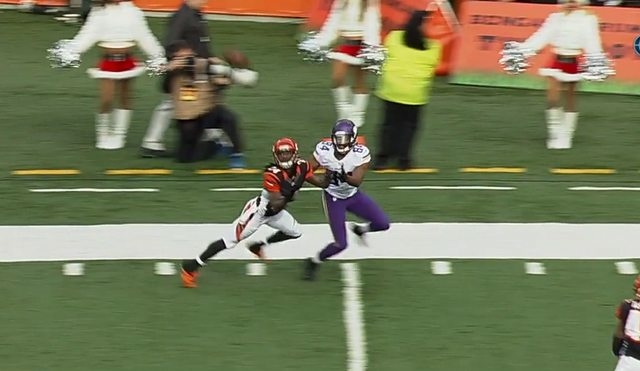 One was an "inaccurate" pass that was placed perfectly given the coverage, and dropped by Patterson. 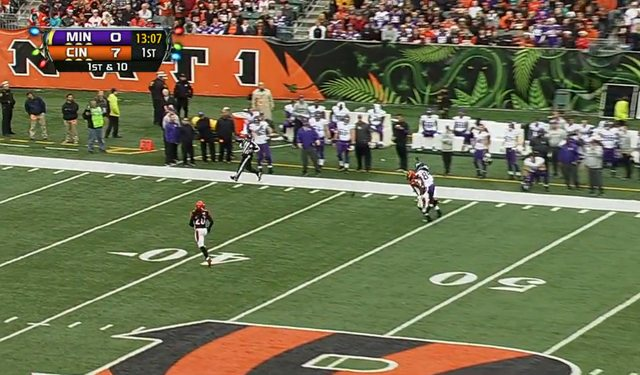 This was the 4th down play in Cincinnati. 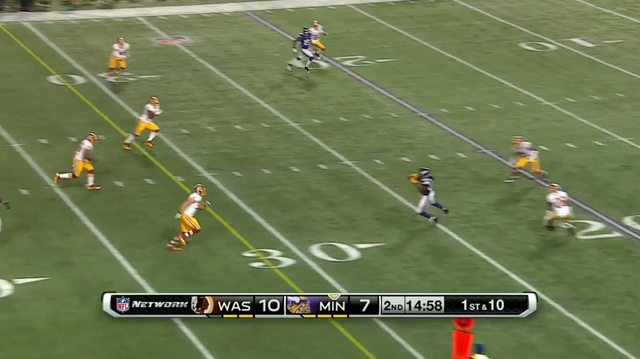 Patterson wasn't really open, Cassel put the ball a little high and outside but gave the WR a chance. 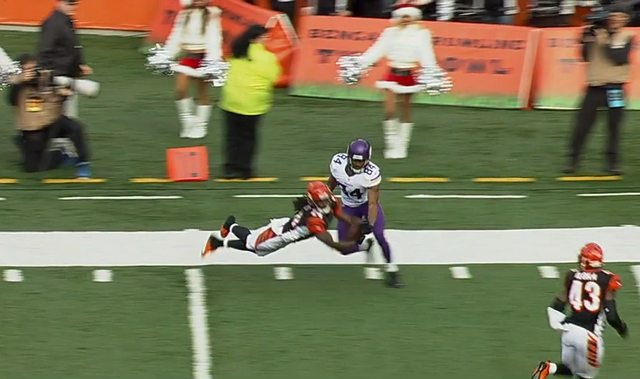 In real time, it looks like a pass defensed, but on replay, Patterson clearly has the ball slip out of his hands before the DB gets there. Ball is coming out in that last image. I'd call that a drop. 3 of the throws were uncatchable. 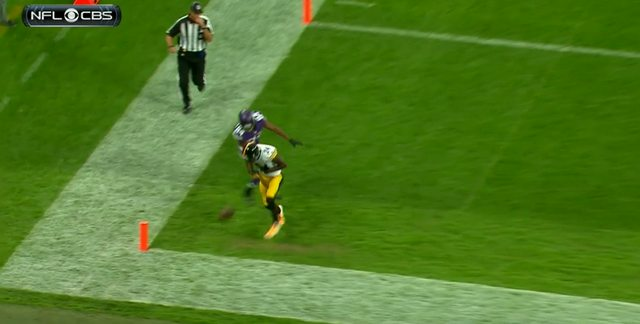 Delivered accurately, that's likely a TD. 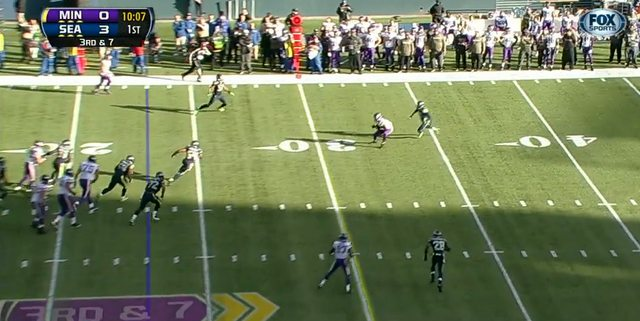 Patterson gets wide open on an intermediate crossing route against zone coverage @GB. 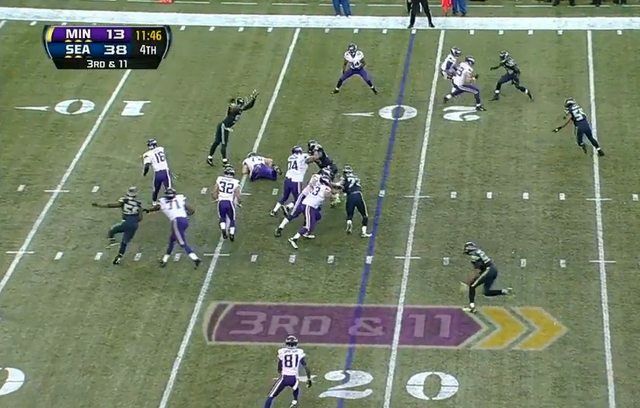 Ponder's throws misses him by a mile. 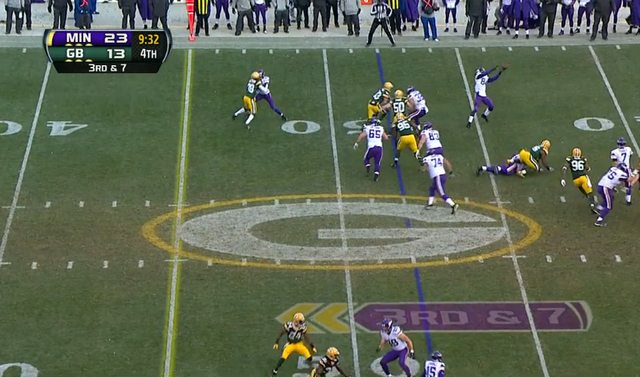 Given the space in front of him, that would've been a big play, maybe a TD, with an accurate pass. I defined "deep" here as 20+ yards beyond the LOS. I charted 17 deep passes targeted to Patterson. 4 of them resulted in penalties for defensive pass interference, for a total of 119 yards. One of them was questionable, an overthrown sideline pass in NY that was probably uncatchable. Of the other 13, 4 of the passes were uncatchable. 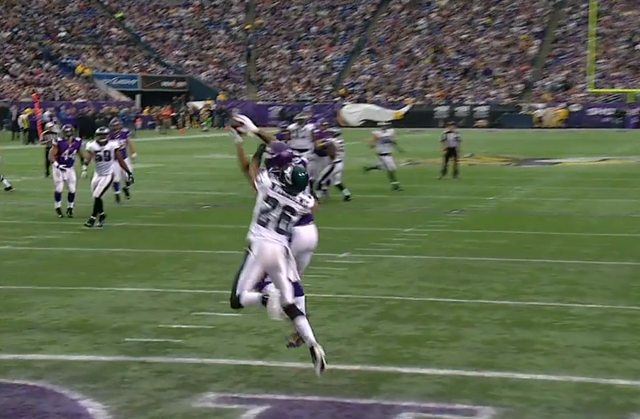 ...or would have, except that Patterson had the presence of mind to reach around him and smack the ball out of his hands. 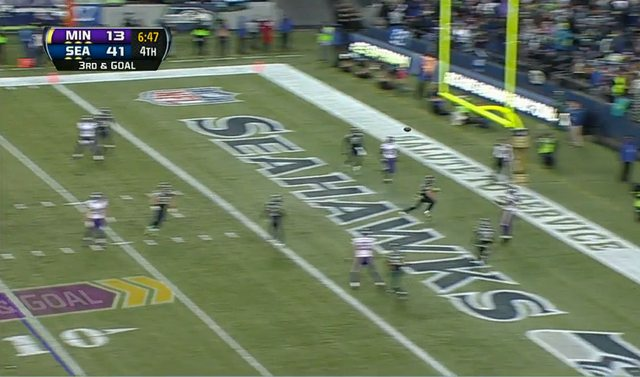 There was also a pass from Cassel late in the Seahawks game that Patterson caught, but well out of bounds. 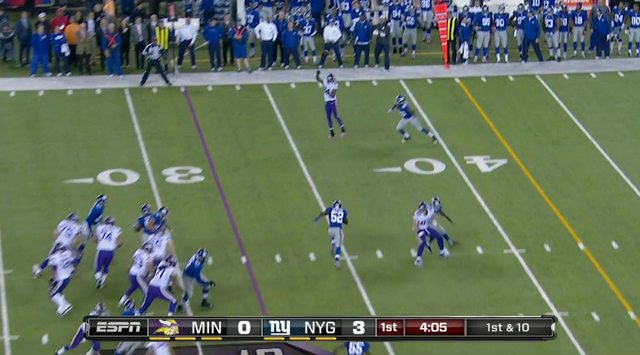 Of the other 9 deep passes, Patterson caught 4. All were at least moderately difficult catches on throws that were not accurate (either hitting him in the chest, or landing over the shoulder). 1 was definitely a drop, on a perfectly accurate pass. 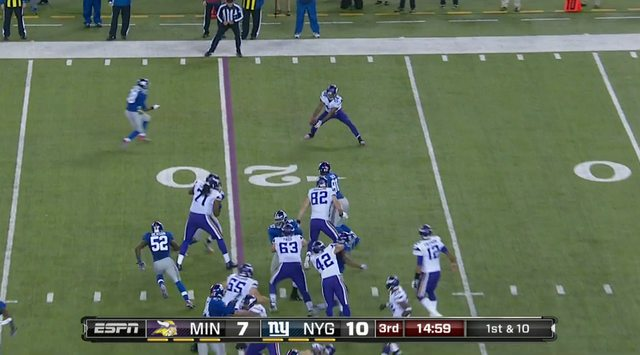 Patterson got open on a sideline go route, Ponder placed an over-the-shoulder throw in stride. 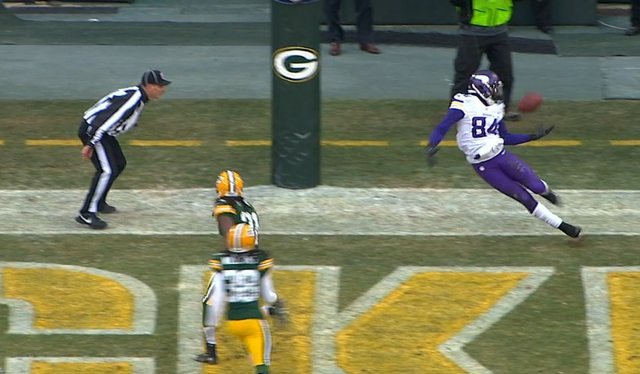 Instead of letting the ball come down and making a basket catch, Patterson leaned back and reached up -- poor technique. 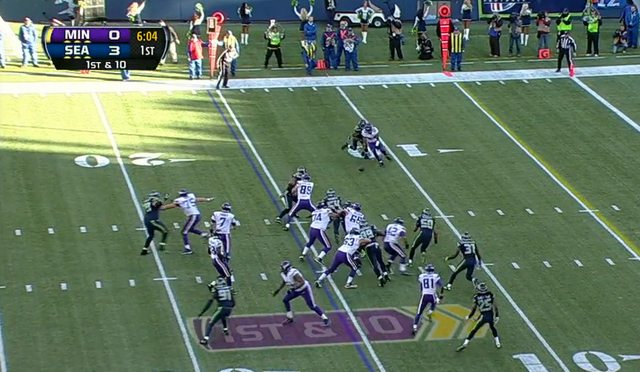 Would've been a gain of 35 yards into scoring range late in the 4Q, probably would have secured a win. 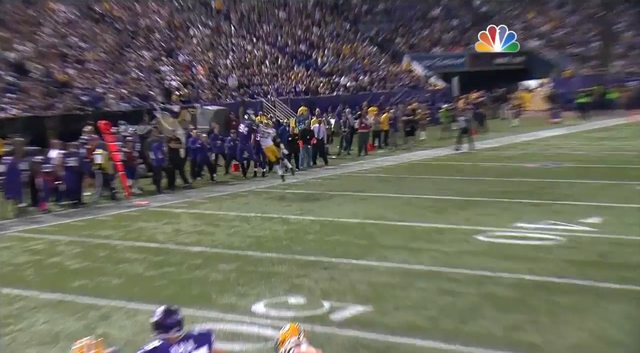 1 could be considered a drop, but it would have been a very difficult catch. ...but it went through his hands. PFF doesn't chart this as a drop, but it really is, even if the weather was a major factor and the catch point was very difficult. 1 was a great play by the DB. 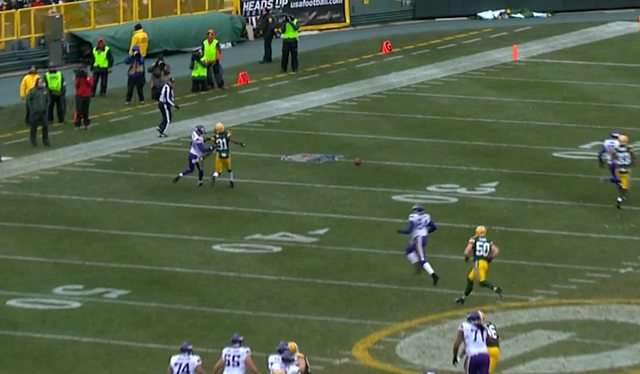 Patterson got open at the back of the end zone in the Lambeau game, Ponder delivered an accurate pass, but Davon House undercut the route and got a fingertip on the ball. 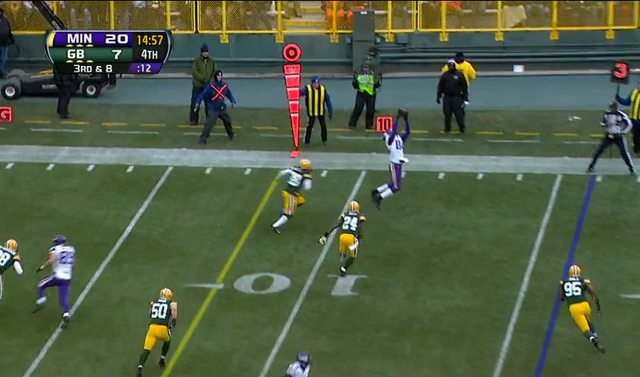 You can see the change in trajectory given how Patterson has to change the level of his hands at the last minute. ...4 caught, for 104 yards. total 8 successful plays of 17, for 223 yards. I'll wrap this up this weekend with a summary, some more gifs, a review of his 2014 preseason performance and some projections for the year ahead.